Everywhere He went, Jesus drew a crowd. During His Ministry, Jesus traveled from town to town healing the sick and casting out demons. The religious “elite”, the Pharisees, did not like all of the attention that Jesus was getting. Jesus was a threat to their authority and power structure. The Pharisees also followed Jesus, but only to “catch” him breaking the law of Moses so that they could have him arrested and killed. One Saturday, Jesus entered the local Synagogue, where He encountered a man with a “withered hand”. Saturday (Shabbat/Sabbath) is a very Holy Day in Judaism because it is the commanded day of Rest. The Principle of the Sabbath actually began in the Garden of Eden where God created the Heavens and the earth and everything else in 6 days and rested on the seventh day. The Pharisees and religious elite had turned the Sabbath Day into a burden by adding to it many man-made “rules”. In-fact, even in these modern times, Orthodox Jewish Rabbis teach that it is a sin to tear toilet paper, apply heat to food, drive a car, turn on and off light switches, etc on the Sabbath Day. Jesus encountered the man with the withered hand on the Sabbath day and felt great compassion for him. The Pharisees were watching Jesus closely to see what HE would do. They wanted to “catch” Jesus healing on the Sabbath because this would be considered “work”. Can you imagine? Jesus was literally healing the sick with GREAT MIRACLES, and all the Pharisees could think of was how they could trick him and accuse him of law-breaking so that they could have him killed. The Pharisees had taken the Commandment of God about the Sabbath, which was meant to bless mankind, and twisted and distorted it so as to make it a burden and a “tradition of man’. Do you think the Pharisees cared at all about the sick people of the land? In Mark 7, Jesus quoted the Old Testament Prophet Isaiah regarding the Pharisees, or the Religious elite, who were self-righteous and had added to the laws of God in order to exalt themselves over the general population. Can you imagine the Pharisees’ reaction when Jesus quoted the words of Isaiah to them? The Pharisees KNEW the prophecies of ISAIAH! In their PRIDE, They had never IMAGINED that Isaiah had prophesied about THEM!!! They thought they were PERFECT, BLAMELESS, above EVERYONE ELSE! When they heard these words, they became enraged and wanted to KILL Jesus! Their plot was to entrap Jesus into breaking one of the Jewish laws, so they could have him killed! And He *said to them, “Is it lawful to do good or to do harm on the Sabbath, to save a life or to kill?” But they kept silent. 5 After looking around at them with anger, grieved at their hardness of heart, He *said to the man, “Stretch out your hand.” And he stretched it out, and his hand was restored. Mark 3 says it all. Jesus could SEE into the Pharisees’ hearts in a way that we cannot! He could see that they could care less for the man with the shriveled hand. Jesus became very angry at the Pharisees because of the hardness of their hearts. They were supposed to be the shepherds of the flock, and instead, they just made themselves fat with all the choice foods and best of everything, and left the flock to grow sick and die. The Pharisees were all about self-preservation and self-gratification. They could care LESS about the people that they supposedly served!!! Are there any “shepherds” (Priests/Pastors/Teachers/Rabbis) that match this description today? Matthew 23:27: Woe to you, scribes and Pharisees, hypocrites! For you are like whitewashed tombs which on the outside appear beautiful, but inside they are full of dead men’s bones and all uncleanness. 7 NOAHIDE LAWS – WARNING/DECEPTION!!! In these last days, the Jewish Sanhedrin, the Court that ILLEGALLY ACCUSED, TRIED, AND CRUCIFIED Jesus 2000 years ago reconvened in Israel in 2009, and is RAPIDLY moving towards rebuilding the Temple (3rd Temple). They believe that their MESHIACH (Messiah) will soon appear. Before Jesus returns, the anti-christ will appear. He will SEEM to be a man of peace, he will be very deceptive, and we believe that the Jewish Sanhedrin will BELIEVE that he is their Messiah (John 5:43, Ezekiel 21:25). They DO NOT recognize JESUS the CHRIST as the PROPHESIED MESSIAH! The Sanhedrin is the same group that ILLEGALLY TRIED and KILLED JESUS for claiming to be the MESSIAH! We are in the last days! The Temple Institute has already made great strides towards building the 3rd Jewish Temple. Unlike the first two Temples, this 3rd Jewish Temple that WILL be built HAS NOT BEEN sanctioned by YHWH! Jesus made it clear in the NEW TESTAMENT, that BELIEVERS in Jesus are now the TEMPLE OF GOD. 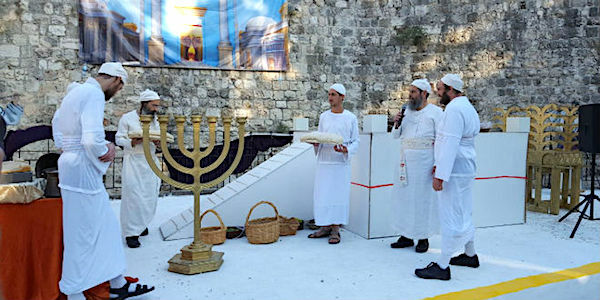 The Jewish Sanhedrin has a golden menorah, a table of shewbread, an alter, and they even have 2 candidates for the red heifer that will be used to “purify” the 3rd Jewish temple! You will see below that they already consecrated the alter on the last day of Hanukkah in 2018! They are READY! They believe that the Sanhedrin will REPLACE the United Nations as an International Body, governed on what they call the “moral laws” of the Bible. However, this is DECEPTIVE BECAUSE these moral laws (7 NOAHIDE LAWS), or codes, are NOT the 10 Commandments, and they are NOT based on LOVE!! !These are a FAKE!!! They did NOT come from the BIBLE (TORAH), they came from the Jewish BABYLONIAN TALMUD originating from what they call “oral tradition”. Jesus called it “The traditions of men”! Quite frankly, this Talmud is very dangerous, and although it may SOUND GOOD, it seems to have it’s origins in the illuminati, freemasonry, and ancient babylonian religion (baal worshipping). The Bible says that in the last days, there will be GREAT DECEPTION that will FOOL even the VERY ELECT if that were possible! Nestled within the 7 Noahide Laws is a law against Idolatry that will PROHIBIT CHRISTIANS from worshiping the TRUE CREATOR – JESUS THE CHRIST! Matthew 24:24: “For false Christs and false prophets will arise and will show great signs and wonders, so as to mislead, if possible, even the elect. Look what has been happening while we’ve been “SLEEPING”…. 2009 – A unique ceremony – probably only the second of its kind in the past 1,600 years – is taking place in Tiberias today: The launching of a Sanhedrin, the highest Jewish-legal tribunal in the Land of Israel. JERUSALEM, 12/02/2018 – The re-established Jewish Sanhedrin is pushing the envelope on the rebuilding of the Temple next Monday, the last evening of Hanukkah, by consecrating a stone altar and reading of a declaration to all nations intended as an invitation to participate in receiving its blessings – leading to an effort to replace the United Nations with a new, God-centered organization. “These are the seven messages of the Creator of the world to humanity known as the Seven Noahide Laws. According to JEWISH TRADITION, the first six of these seven laws were given to Adam in the Garden of Eden. When God established His covenant with Noah, He added the seventh (and the sixth became applicable). FALSE TEACHING ALERT!! !..…According to THE JEWISH BABYLONIAN TALMUD, a Gentile (non-Jew) does not have to follow the Mosaic Law; however, all Gentiles are OBLIGED to follow the Noahide Laws. THEY SAY that the laws given to Noah’s children are universally binding. THEY CONSIDER a non-Jew who abides by the Noahide Laws as a “righteous Gentile,” . According to THEIR FALSE Jewish teaching, a “Noahide” will earn a reward in the afterlife, if his obedience is coupled with a knowledge that the laws come from God. A “righteous Gentile” might also be called a “Hasidic Gentile” or simply a “Noahide.”….This is FALSE, teaching! “Whoever sheds human blood, / by humans shall their blood be shed; / for in the image of God / has God made mankind” (Genesis 9:6). Other than Noah being told not to eat raw meat, there is NO HINT of the Noahide Laws in these passages. Matthew 24:37: As it was in the days of Noah, so it will be at the coming of the Son of Man. According to the Jewish Babylonian Talmud, ALL Gentiles (non-Jews) are OBLIGED to follow the Noahide Laws. Do you know what the punishment is for disobeying a Noahide Law? The punishment for disobeying a Noahide law is death by BEHEADING. Now, we’re not saying that the Noahide laws will be THE laws that will cause the beheading of the Tribulation Saints written in the book of Revelation (Rev. 20). There is also another religion out there that already beheads Christians. Also, just to clarify, we do believe in the Pre-Tribulation Rapture;however, those beheaded during the Tribulation will be the “Tribulation Saints/Jews” who come to Faith in Jesus during the final 7 years. But, it’s still important for Christians to be aware that these Noahide laws exist, that the punishment for disobedience is beheading, and that they will likely play some type of a “deceptive role” during the seven year Tribulation! Even if we are Raptured out of harm’s way, we still have family, friends, and loved ones who may remain behind and who will fall prey to these deceptions if we don’t warn them! Wouldn’t we want to warn them? In 1991, both houses of Congress passed a bill, signed into law by President George H. W. Bush, that declared the Noahide Laws to be “the bedrock of society from the dawn of civilization” and the “ethical values and principles . . . upon which our great Nation was founded” (H.J.RES.104.ENR). H.J.Res.104 – To designate March 26, 1991, as “Education Day, U.S.A.”.102nd Congress (1991-1992). Revelation 20:4: Then I saw thrones, and they sat on them, and judgment was given to them. And I saw the souls of those who had been BEHEADED because of their testimony of Jesus and because of the word of God, and those who had not worshiped the beast or his image, and had not received the mark on their forehead and on their hand; and they came to life and reigned with Christ for a thousand years. This blog post is NOT to in any way denigrate TRUE Judaism, which is a sister to Christianity. Many Jews will recognize Yeshua Jesus as their Messiah and mourn as one mourns for an only son (Zechariah 12:10)! We pray for our Jewish brothers and sisters..particularly praying that they NOT be deceived by the anti-christ!!! Romans 2:29: But he is a Jew who is one inwardly; and circumcision is that which is of the heart, by the Spirit, not by the letter; and his praise is not from men, but from God. We believe that the anti-christ will PRETEND to be the Jewish Messiah for the first 3.5 years of the seven year Tribulation. Why do we think this? Although the Bible doesn’t specifically state this, there are numerous “hints” embedded in Scripture for those who have ears to hear. As always, Holy Spirit is our teacher and guide!!! John 5: You search the Scriptures because you think that in them you have eternal life; it is these that testify about Me; 40and you are unwilling to come to Me so that you may have life. 41 I do not receive glory from men; 42 but I know you, that you do not have the love of God in yourselves. 43 I have come in My Father’s name, and you do not receive Me; if another comes in his own name, you will receive him. In John 5, Jesus was telling the Jewish leadership that HE WAS the PROPHESIED MESSIAH, coming in HIS FATHER’S NAME (Yeshua means YHWH’s SALVATION), but they REFUSED to believe!! However, one day another would come in his own name, and they (Jewish elite) WOULD receive him (believe this man was the Jewish Messiah)! Jesus was telling the Jewish elite that one day they would be deceived by the antichrist, the man of sin. Ezekiel 21 is a scripture about the “wicked one”, the “prince of Israel”, who comes at the time of the end. This is another reference to an evil man who comes as a Jew, the “prince of Israel” (false messiah/antichrist). Christ means Messiah, or the “anointed one”. The anti-christ has NOT been anointed by YHWH, and he will cause GREAT DESTRUCTION! After the 7 years are complete, YHWH Elohim will REMOVE this false messiah when Jesus, the TRUE KING and MESSIAH, returns to RULE and REIGN from JERUSALEM! 2nd Thessalonians 2:3: Let no one in any way deceive you, for it will not come unless the apostasy comes first, and the man of lawlessness is revealed, the son of destruction, 4 who opposes and exalts himself above every so-called god or object of worship, so that he takes his seat in the temple of God, displaying himself as being God. One of the reasons that many people believe that the 3rd Temple has to be rebuilt before Jesus’ return is because 2nd Thessalonians states that the “man of sin” (aka anti-christ/false messiah) will take his seat (of authority) in the Temple of God (Jewish Temple), displaying himself as God. Personally, I kind of think there is more to these verses than meets the eye, especially when the true Temple of God is now the human body, NOT a physical Temple. None-the-less, the Jewish Sanhedrin ARE going to build the 3rd Jewish Temple, and the anti-christ will likely take his “seat” of authority in that Temple. Here’s one more Bible verse that indicates the anti-christ will be PERCEIVED to be the Jewish Messiah by the Jewish people. Even if he’s not really Jewish, he will probably have fake Jewish credentials, blood, DNA, something that will “prove” to the Jewish Sanhedrin that he is their Jewish Messiah from the Tribe of David. Zechariah 11: 15 The Lord said to me, “Take again for yourself the equipment of a foolish shepherd. 16 For behold, I am going to raise up a shepherd in the land who will not care for the perishing, seek the scattered, heal the broken, or sustain the one standing, but will devour the flesh of the fat sheep and tear off their hoofs. This man from the Jewish Sanhedrin believes that the 3rd Jewish Temple and the messiah whom they will receive (not the TRUE MESSIAH YESHUA JESUS) will bring peace…but he’s wrong. The false messiah whom they will receive will bring DESTRUCTION! Only Jesus Christ, the PRINCE OF PEACE, will bring TRUE PEACE when HE RETURNS! In Matthew 24, Jesus issued the Jewish people a STERN WARNING that when they SEE the abomination of desolation standing in the Holy Place, they need to run for the mountains! Many scholars believe that the anti-christ IS the abomination that makes desolate (Daniel 9:27). In Matthew 24, the Jewish people are the “elect”. Jesus says that after this “event” occurs when the man of sin “stands” in the Holy Place, life will get so difficult for the Jews that if God hadn’t shortened the days to 3.5 years, NO FLESH would survive! This man of sin will appear to be Israel’s Savior (Messiah) during the first 3.5 years of the 7 year Tribulation (Daniel’s 70th “week/7 year period”), but by the middle of the “week” (after the first 3.5 years), he will turn on them, openly seeking their destruction. Pray for Israel and the Jewish people, even those on the court of the Sanhedrin! They will truly BELIEVE this false messiah will bring peace to the world, but he’s a deceiver! He seeks their destruction!! He will bring GREAT TRIBULATION/TIME OF JACOB’S TROUBLE!!! Jesus is the only path to salvation! WE don’t have to (nor can we) “save” ourselves!